While building an entirely new insurance product from the ground up, the way we process and safeguard your data has always been at the forefront of everything we do. And we’ve just taken the next step. We’ve been accredited with a certification called ISO 27001. It might sound like the name of a droid in the latest Star Wars movie, but it’s actually an international standard that sets out how businesses should keep their data secure. ISO 27001 is an elusive certification. While we obviously can’t guarantee that it’s impossible for anything to happen to your data, our ISO 27001 certification shows we take information security more seriously than firms without it, and that we’re better equipped to deal with issues should the worst happen. 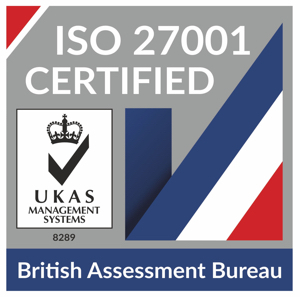 After a one-year implementation period here at By Miles, the British Assessment Bureau completed a full on-site security audit, and made the decision to issue us with an ISO 27001 certificate. We’re serious about data protection, and hope that this certification provides a bit of extra reassurance that we’re practicing what we preach, so to speak. You’ll see the little badge below at the bottom of our website homepage to verify our certification. You can read more about the ISO 27001 standard here, and you can view our Information Security Management Policy here.